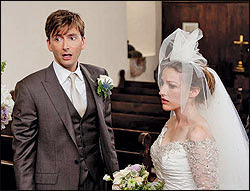 David Tennant filmed a movie called The Decoy Bride from mid-June until the end of July 2010. Kelly MacDonald and Alice Eve also star in the movie which was directed by Sheree Folkson. 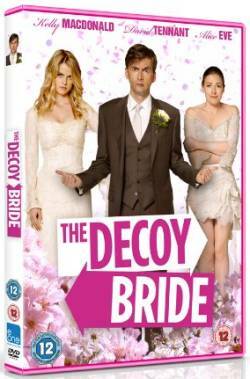 The description of the movie is: "The Decoy Bride tells the story of a superstar actress, Lara (Eve), who just wants to marry her cute British boyfriend James (Tennant), and believes the sleepy Scottish Island of Hegg is the one place the world’s press won’t find them. But when an ingenious paparazzo tracks them down, the diva must find a decoy bride and thinks local girl Katie (MacDonald) will be an ideal replacement. But when Katie meets James, sparks fly." Rehearsals started in London on 21st June for one week. Filming then started on the Isle of Man on 27th June and continued until 12th July. Production then moved to Glasgow for the period from 12th July until 31st July. However David was not required each day of filming. The movie was shown to distributors at the Cannes Film Festival during 2011. The DVD is available on Amazon. The release date of the DVD in the UK was 12th March 2012. The movie's official release date was Friday 9th March as it was shown in a few cinemas. It will be released in the US on Tuesday 26th June and in Australia on Wednesday 11th July. Some US cable television channels started broadcasting the movie from Friday 3rd February and it was released in a couple of US cinemas from 9th March. The Decoy Bride was shown at the Glasgow Film Festival on 21st and 22nd February. See here for more details. The Decoy Bride has started being broadcast on Sky Movies Box Office. Check listings for other broadcasts. For posts related to Decoy Bride on Blogger.com click here. David Tennant was not involved in any promotion for the movie after completing filming. The Independent ends its review with the phrase " Tennant does his best in a strangely written role requiring him to be supercilious and charming at the same time. It's a trick that even Cary Grant in his prime would have struggled to pull off." Slant magazine does not even mention David Tennant but does give the movie 2.5 stars in a very detailed review.